So. The fridge is stocked with dogs, and burgers. The cooler is stocked with beer. The Hawaiian Tropic and pool noodles are lined up by the slip and slide. Tradition is great but man (and woman) can’t live by backyard bbq/party alone. Read on to change up the scenery. Go Go’ers, getting rid of the inflatable palm tree is not enough to avoid cliché. Think 13 is an unlucky number? 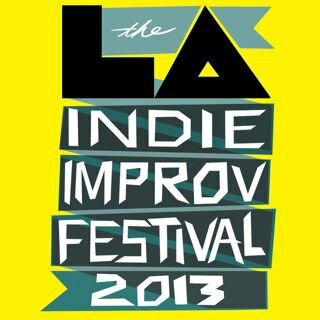 You’ll think again after kicking off the weekend watching 13 hours of improv at the LA Indie Improv Festival. That’s right, get ready for a funny bone workout. There’s something for every improv persuasion: five different stages, over 100 improv teams with p(h)unny titles like Tupac Liqueur and Werner Hotdog, and Theme Hours including 2 Man Power Hour, Hip Hop Block, and two separate Musical Improv Hours — for those of you with massive record collections, photographic memories, and too much time on your hands. Producers TNT, Crashbar, Room 101, the 11th Hour Show, and the Manifesto Show are clearly the coolest kids on the block, however, and the whole, 13 hour shebang is free. You’ll want to bring some shekels for the food trucks, though. A Somewhere Over the Rainbow improv is unlikely to get you a free kebab. In their quest to highlight fiber art as fine art rather than an oft-dismissed and marginalized “craft”, the guerrilla art group — or knit graffiti collective as they call themselves — known as Yarn Bombing Los Angeles (YBLA) have previously knitted and crocheted trees, fire hydrants, and parking meters. No word on meter maid reactions to the latter. Making their flashiest and most fabulously fun statement yet, the Yarn Bombers have set their sights on a craft/architecture contrast and collaboration with Granny Squared. 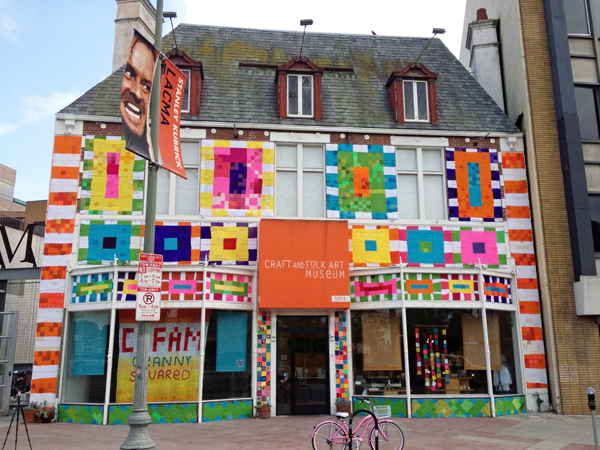 The already dollhouse-like Craft and Folk Art Museum (CAFAM) has been covered in 12,000 five-inch, crocheted “granny squares” submitted by artists from 50 states and 25 countries. Contributors include visually impaired crafters from the Braille Institute and neurotherapy patients from a Turkish village. You can meet and mingle with YBLA founders and local bombers at the opening reception this Saturday night. Go Go’ers, just don’t try to take home a granny square as a potholder/souvenir. On display through July 1st, the squares will then be taken down and sewn into blankets for Thanksgiving installation and distribution at the Downtown Women’s Center (DWC) and sale to the public at MADE, the DWC’s retail/resale boutique. Whether you do a drive-by or get up close and personal, the Granny Squared CAFAM is def the best-dressed building in town. Here’s the thing about “normal” Memorial Day weekend barbecues. Generally, you can’t shop, eat kimchi, or drink summertime sake punch. And if all of the above ARE happening, Ms. Go Go would like directions to your party pad. Alternatively, head over to Susan Feniger’s Street for the former Top Chef finalist’s A Korean BBQ of Giant Proportions. Collaborating with Boutique Sake’s Yoshi Murakami, who’s created a Sake/Soju Lounge on the patio, and Giant Robot, the West L.A. gallery of great/playful/nutso art, Feniger will be dishing up Korean short ribs and other Korean nom nom like Bibimbop and five kinds of kimchi including Green Peach! 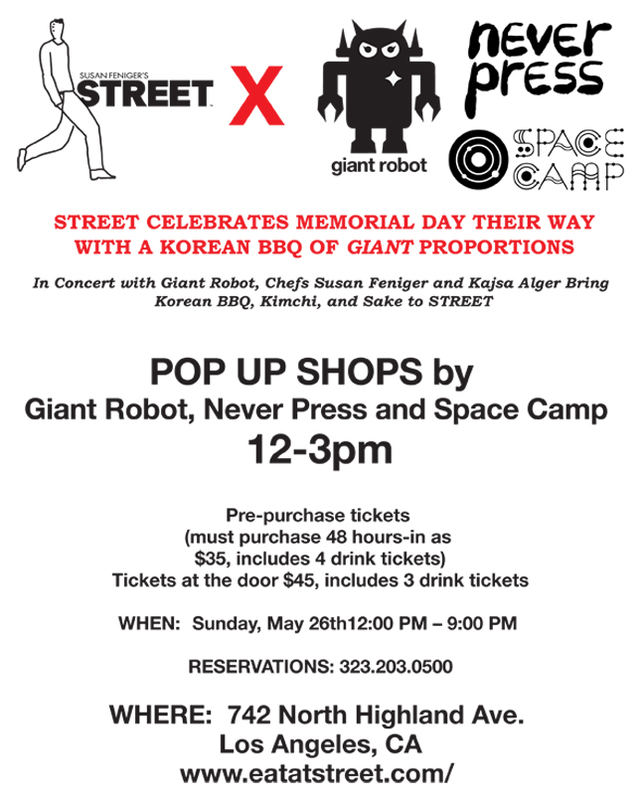 Giant Robot and their pals at Never Press and Space Camp will have pop-ups from noon to three but the BBQ bash runs from noon- 9pm. It’s possible you could even fit in another engagement, one with rubbery chicken and overly-mayo’ed coleslaw…. But seriously, were you not paying attention during the summertime sake punch and Green Peach kimchi part? Sometimes, nothing will do but to kick off the (faux) start of summer with a big, music blow-out. There are plenty around this weekend but the fest with the most bang for your buck has got to be the Jazz – Reggae Festival over at UCLA. Sunday’s “Jam Day” features Santigold and Common, just for starters, while Ziggy Marley headlines “Reggae Day” on Monday. You might be able to think of some other leisure activities to do out on the Intramural Field. Food vendors go beyond the usual suspects with a range of Caribbean and Southern-centric fare including Derrick’s Jamaican Food, Irie’s Choice, and Kobbler King. Oh, yeah. It’s starting to feel like summer. 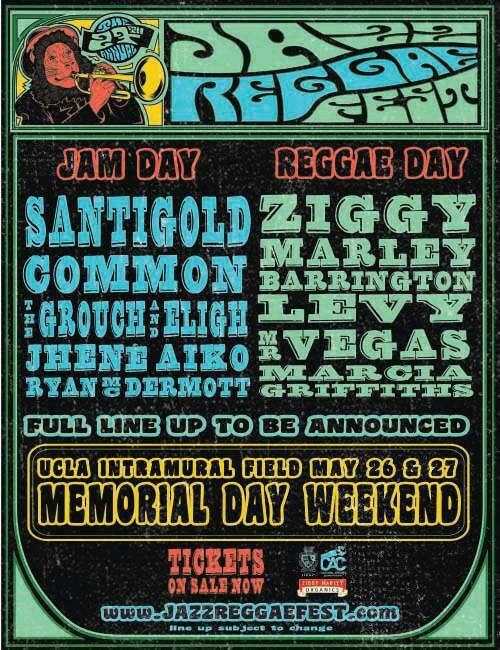 THE 27TH ANNUAL JAZZ – REGGAE FEST — Sun, May 26 & Mon, May 27; noon – 7pm; $30 – $60 — UCLA Intramural Field, 405 Hilgard Ave, LA, 90025.